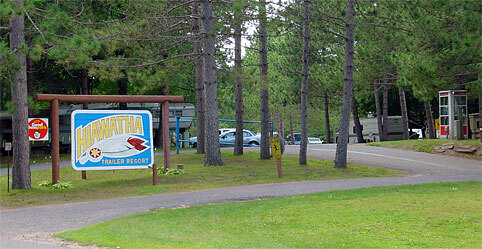 Our trailer resort offers the ultimate in full-season trailer accommodations. The quiet, well-groomed grounds have been a favorite resting place for many of our guests year after year. Hiawatha is located within minutes of shopping centers and other attractions,such as, water ski shows, go carts, water slides, mini golf, craft shows, antique shops, and a summer playhouse. Guests can also take advantage of the parks' planned activities or take a shuttle to a number of different area casinos. We're open from May1st until mid- October.